Sarah Hulse in a photo illustration from the Inlander's 2015 Fall Arts Preview issue. The Inland Northwest is in the midst of a major writing boom. 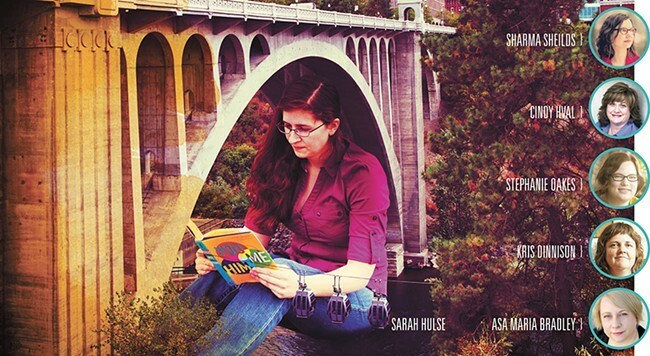 Next up on a growing list of local writers who've been honored of late for their contributions to literature are Spokane-based authors Sarah Hulse (who publishes as S. M. Hulse) and Stephanie Oakes. Both are recipients of literary honors for their debut novels released last year — Hulse's emotional Western drama Black River and Oakes' haunting young adult novel The Sacred Lies of Minnow Bly. This morning, Hulse was named a finalist for the prestigious PEN/Hemingway Award for Debut Fiction for Black River. The PEN/Hemingway Award for 2016 — this year marks its 40th anniversary — was ultimately granted to Ottessa Moshfegh, for her debut novel Eileen. Founded in 1976, the PEN/Hemingway is given each year to recognize a novel or short story collecting by a debut American author. A jury of fellow authors and previous winners was tasked with selecting this year's award selections. Black River, published in January 2015, is Hulse's first novel, and among other honors it was named a 2016 American Library Association Notable Book, and was long-listed for the 2015 Center for Fiction First Novel Prize. Also garnering recognition for her impressive publishing debut is Spokane Young Adult author Stephanie Oakes, whose heart-wrenching novel about a teen girl who escapes life in a primitive religious cult, The Sacred Lies of Minnow Bly, was named a 2016 Golden Kite Award Honor Book. The honor is bestowed by a jury of fellow authors and illustrators with the Society of Children's Book Writers and Illustrators, an international organization for contributors to children's literature. Oakes' novel was named an honoree in the Young Adult category; the Golden Kite awards also recognize genre selections in middle grade/young reader, nonfiction, picture book text, picture book illustration and humor. This isn't the first honor for Oakes, either. Her book was also named a 2016 finalist for the William C. Morris Award, which annually recognizes the best books for young readers published by first-time authors. During next month's local literature celebration Get Lit!, meet and hear from both authors during a panel of debut women writers, moderated by yours truly.